Abyss, Nappy Roots, Georgia ME, Queen Sheba, Tommy Bottoms and many more. These iconic Spoken Word Activist have made an indelible mark on our culture. Max currently holds the status of ushering in the new year with the #1 Spoken Word Audio Single, Dedicated To Justice. - Maximum Impact END GAME-. In an unprecedented acknowledgment for the capitol city of South Carolina, Max Parthas was voted as the number one male solo artist across all genres. (www.Free-times.com) "Best of Columbia 2008"
And in January of 09 received the 2008 BEST FEATURE AWARD from the Nashville SFPC Organization. In 2008 The poetry power couple successfully organized and headlined one of the largest Spoken Word tours in US history. This was their third national tour in a single year. 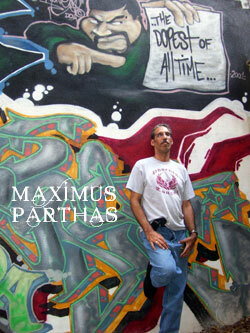 Out of over hundreds of entries from across America & Europe, November of 2007 saw Max Parthas ranked as one of the top ten Spoken Word artists worldwide. -Famecast.com season 3-. In season 4 he is was ranked as the # 2 artist across all genres. Also during Season 4 Max created the successful marketing campaign which led Queen Sheba to a world wide # 2 Famecast ranking. With an unmatched work ethic, between 07 & 08 Max Parthas & Tribal Raine have physically appeared in several hundred venues and cities across the breadth of America Poeticizin for gangstas and governors, from neighborhoods to Hollywood. In schools, churches, clubs, parks and prisons. Positively changing minds and touching the lives of people across all levels of society with their inspirational work and memorable character. This poetic dream team is showcased on numerous cable shows, radio programs and magazines. 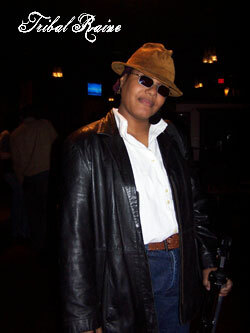 M- Voted Most Inspirational Spoken Word Audio 2009 for the single RISE UP!!! ~1st Wave~ & ~End Game~. Both were released on January 30th with the Militant Muzic Records Label. The star studded CD release party was hosted by the Prysmatic Dreams venue 'SAHAS' in Columbia, SC. the End Game CD release party was a poetic indication of changes to come. Amazingly, Max & Tribal have even been responsible for adding to the American lexicon. Max Parthas has recently taken the mantle of hosting The Session LIVE!!! in Columbia, SC A LIVEWORLD WIDE STREAMING event every 2nd tuesday of the month. The April 7th launch had a packed house of inspired people poets and performers and listeners from 7 nations.Future shows looksto be an even bigger success. 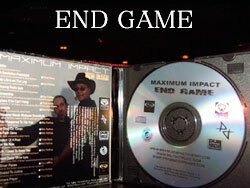 Max & Tribal are working with producers across America & the globe creating the 2010 CD from Maximum Impact. Stay tuned for. Guest appearances, interviews, speaking engagments & a national tour with Prysmatic Dreams, The NWO & Poetry Over Music all scheduled throughout the year. Check here for current updates. They have been called one of the hardest working couples in the industry and they probably are. Prysmatic Dreams Poets and New Word Order artists.